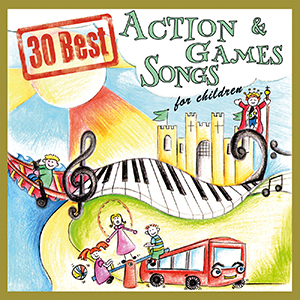 Each of the 30 Action and Games Songs has been chosen for this album because they either require the child to do something such as move their arms around, clap, jump up and down or follow the actions, or the song is based around a children’s game or playground activity. The collection is designed so that the adult can choose a suitable selection of children’s songs for party games, or just to occupy their children in an active way allowing them to burn off that excess energy, or simply to pass on this wonderful music to the next generation of children supporting them in their development and enjoyment of music, movement, rhythm and rhyme. All the playground favourites are there including I’m The King Of The Castle, Eeny Meeny Miny Moe and Pat-A-Cake, Pat-A-Cake Baker’s Man plus many action songs from The Wheels On The Bus to The Farmer’s In His Den as well as Party Games songs such as In And Out The Windows and of course; Hokey Cokey. The tracks have been created with the utmost care and passion to ensure that they are presented in the very best performance and audio quality whilst covering a wide variety of styles and genres. Simple melodies and lyrics steeped in history combined with professional arrangements, real instruments and human performances ensure that both the adult and child can appreciate and enjoy the music together. Furthermore on this collection we have presented every lyric to every track so that the family can all sing, act and play along together.